Today I am recreating the first card design that I did on my YouTube channel to celebrate the one year anniversary of my channel. I stamped a few of the images from the Book Worm stamp set on Neenah Solar White cardstock with Gina K Amalgam ink. I colored them in with my Copic markers and then cut them out with my Scan N Cut 2. I used the large bookmark die from the Bookmark It die set from Mama Elephant to cut a bookmark out of Midnight cardstock from Brutus Monroe. I then stamped some of the images from the Book Worm stamp set and the Good Reads stamp set onto that bookmark as well as a panel of A2 size Midnight cardstock with Versamark ink. I then took that A2 panel and glued it to a card base. I die cut a large circle out of white cardstock and then stamped a row of books across it with Simon Says Stamp Fog ink. I also stamped a sentiment above that row of books from the Good Reads stamp set. I stamped the “This book belongs to” label onto some white cardstock and cut it down to a strip. I glued that label onto my bookmark along with a stack of books and the bookworm. I then added some silver twine to the top of the bookmark. 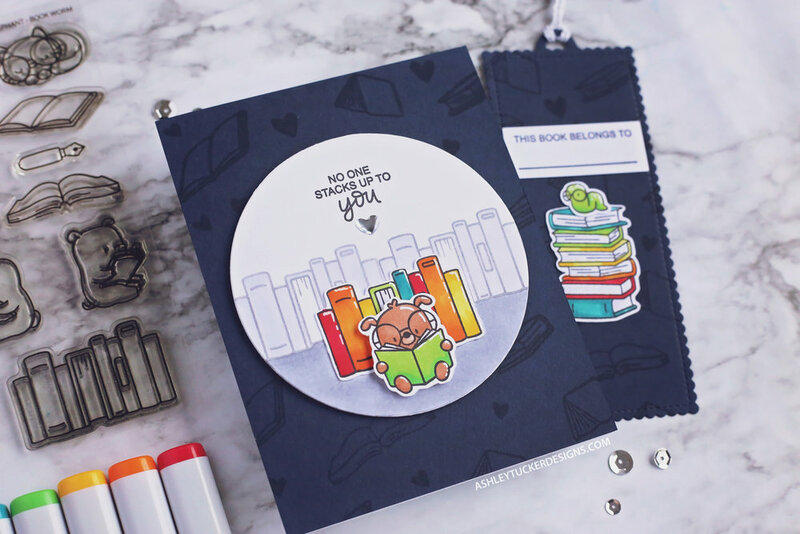 Next I took the circle die cut and popped it up on my card with foam tape being careful to leave a space for the bookmark to slide in behind it. I glued the row of colored in books in front of long row of books with Gina K Connect glue. I then popped the dog up in front of those books with foam tape. Using a white gel pen I added highlights to all of the colored in images. I then colored in the background of the circle die cut with a few light gray Copics. Finally I added a silver glossy heart sticker under the sentiment. <<So I just created this blog so sorry for the lack of photos and information in these first few posts. In the future I hold to write more and take more photos! This bookmark is part of the series of bookmarks that I created for my friend Joey. To start this bookmark I used Strathmore bristol watercolor paper and did some ink blending. For the blending I used Tim Holtz blenders, distress inks, and one Stampin' Up ink. After all the ink dried I used Versamark ink to emboss the hexagonal shapes onto the background. Using my fuse tool I created a sleeve for the bookmark so that I could turn it into a shaker. To start this bookmark I used Strathmore bristol watercolor paper and did some ink blending. For the blending I used Tim Holtz blenders and distress ink. After that I embossed the Enjoy Every Moment sentiment with black embossing powder. Sadly the stamp set that this sentiment comes from is no long available to buy. Then I embossed a bunch of stars from various different stamp sets. The Enjoy Every Moment stamp is from an old Micheal's stamp set that is not sold anymore. For this bookmark I used my Tim Holtz blenders to do some ink blending on some watercolor paper. I used some blue distress inks to try and make a night sky. When making a sky you want to have lighter color at the bottom going to a darker color at the top. I used white embossing powder to emboss a bunch of stars and a moon. Sadly I had a lot of trouble with the embossing on this bookmark. I forgot to test the paper before starting the embossing to make sure it was dry. As it turned out the paper was not dry enough from all of the ink blending so the embossing powder stuck to everything instead of just the stamped areas. See the video below to see how I worked through all the problems that arose. After finally getting all of the embossing issues sorted I used my fuse tool to make this bookmark a shaker bookmark.